Light, crispy on the outside, and chewy on the inside, these cookies are an antidote to all of the heavier chocolate desserts that abound during the holidays. They’re sweet, of course, because…well, they’re cookies! But they’ve got dried cherries in them, which are slightly tart, and a lime glaze, which is decidedly tart (though, oddly, made mostly of sugar!) 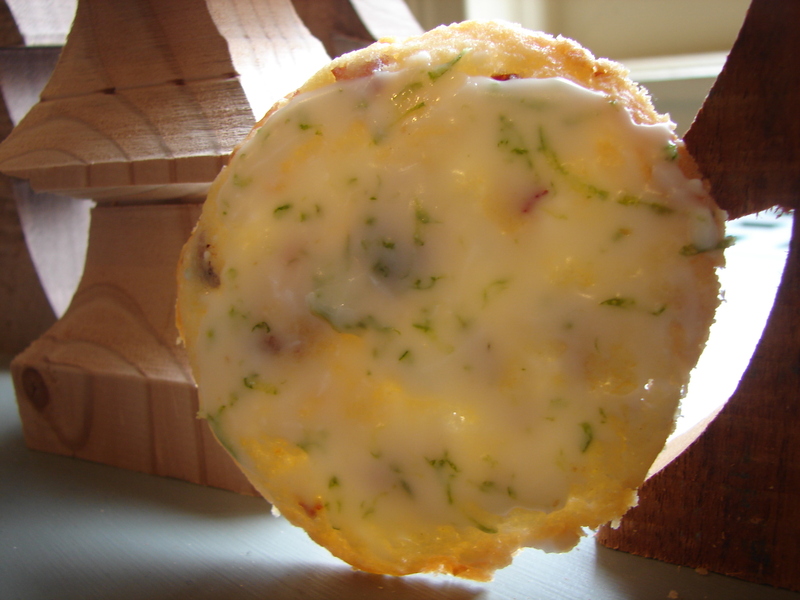 Easy to make, and very pretty, with their lacy texture and flakes of green against pieces of red cherry. Do you remember cherry lime rickies? I have a vague memory of being told about them when I was a teenager and worked at a soda fountain. Are they real? What are they? These were the thoughts going around in my head as I made these cookies. It’s got to be Coconut, by Harry Nilsson, doesn’t it? This song always scared me a little bit. Combine the cherries and coconut, and whiz them for a minute in a food processor until they’re crumbly, but still substantial. Cream the butter. Add the sugar, vanilla and rum and beat till it’s all fluffy. Add the egg and beat well. Add flour, salt and baking powder. Mix well. It should be droppable by spoonfuls, but rollable between the hands, as well. Stir in the cherries and coconut. Drop by teaspoonfuls onto the baking sheet. You can leave them just like that. If you’ve gone crazy and want things to be a little neater because you’ve started taking pictures of everything you bake or cook so that you can post pictures on some stupid blog, you can roll them between your hands and then press them down slightly, so they’re neat little patties. They’ll spread out, so leave a bit of space between them. Bake them at 375 for 10 or 15 minutes until they’re starting to get golden brown on the edges. Let them dry on the sheets for a moment, and then put them onto drying racks to get nice and crispy. While they’re cooking, mix the icing sugar with the lime zest and lime juice. The juice should be enough to make the glaze spreadable, but you can always add a dash of milk or water, if you feel you need to. You can use less zest, if you don’t like too much lime flavor. 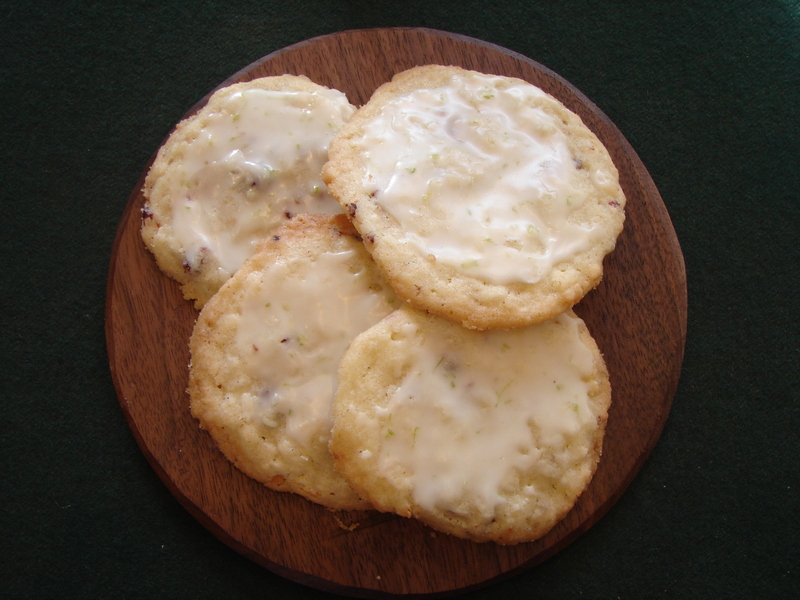 While the cookies are cooling, spread a big dollop of lime glaze on each one. Let them totally cool, and let the glaze, totally set. Like, totally. Then eat them! This entry was posted in cookie, recipe and tagged coconut cherry cookies, coconut cookie, Lime glaze, tart dry cherries by Claire. Bookmark the permalink.